Twitter bring people closer to their peers. Twitter brings people closer to brands. Twitter brings people closer to celebrities. But Twitter also brings citizens closer to their government. And nowhere is this more the case than with municipal mayors in the United States. There have been a handful of mayors lauded for their use of Twitter (and social media in general) throughout the years, but there’s never been a full accounting of who uses Twitter – and who uses it best – until now. Development Counselors International (DCI) is a communications firm that specializes in marketing places. DCI is also a long-time Convince & Convert client. They set out to determine which mayors have mastered Twitter, and how much city size and other factors might contribute to their aptitude on the platform. DCI started by looking at mayors from the 250 largest US cities. Of that group, 186 mayors were on Twitter. Mayors with fewer than 1,000 Twitter followers were eliminated, narrowing the list to 110 officials. Each mayor’s Twitter activity was then analyzed for a 60-day period (January and February, 2016). To assist in the data collection and analysis, DCI (with help from me and the C&C team) used software from LittleBird and RivalIQ to measure influence and engagement, respectively. (disclosure: I am an investor in both firms, and we use both platforms at C&C). To see the full list of 25 top mayors, visit the special microsite and download the entire report. You’ll see that three of the top 25 are from Kentucky. Also three of the top 25 are from Tennessee. And comparatively few mayors in California (and the western USA, overall) are on the list, even though Twitter was invented in California! Some of these mayors include “mayor” or similar identifying language in their actual twitter handle. Others do not. I assessed this in the full data set and found that 59 out of the 110 top mayors do include a signifier in their handle. A majority, but certainly not universal. In addition to the overall list of top mayors (beyond the top 25, DCI can also provide the full list of 110), the best officials in each of the ranking criteria categories were also identified. 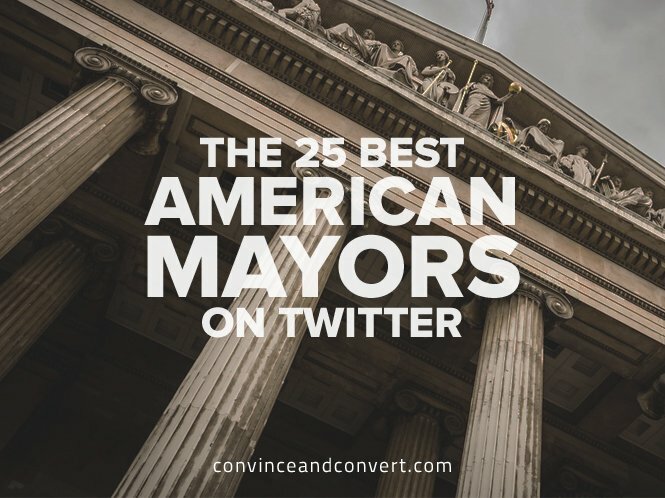 For the entire list of top mayors by each category, visit the DCI Tweet Elite microsite where you’ll also find written interviews and podcasts with top mayors talking about how and why they use Twitter to connect with their constituents. Thank you to DCI for putting this interesting report together, and thanks to RivalIQ and LittleBird for the data.